The U.S. Navy's new satellite to provide more agile communications for forces on the move has successfully maneuvered itself into a perch 22,300 miles above Earth and unfurled its giant umbrella-like mesh antennas. Launched by ULA's Atlas 5 rocket on Feb. 24 from Cape Canaveral into a geosynchronous transfer orbit, the Mobile User Objective System 1 satellite has executed eight firings of its liquid apogee main engine to ascend from that dropoff point. The rocket delivered the craft to a preliminary 2,150 by 22,237 statute mile orbit, which has now been circularized, and the inclination was reduced from 19 degrees to about 5 degrees relative to the equator. Deployment of the craft's power-generating solar arrays has occurred, now spanning more than 90 feet, and the pair of antenna reflectors on boom assemblies took place as planned. The communications payload carries two gold mesh antennas, built by Harris Corp., to serve legacy-equipment users transmitting through a 17.7-foot-diameter reflector on the bottom of the craft and the advanced, multi-beam features of MUOS to significantly increase the transmission capacity over the Navy's previous satellites through a large 46-foot reflector atop the satellite. Satellite-builder Lockheed Martin is conducting its checkout of MUOS 1 before handing control to the military for acceptance testing. The craft is scheduled to enter service later this summer. The Navy has not announced which of five available orbital zones the spacecraft will be operated from -- the vast Pacific Ocean, the continental U.S. coverage area, the Atlantic Ocean region, or two positions over the Indian Ocean and the Middle East. The testing location is over the Pacific in view of ground station in Hawaii. The expansive footprint of MUOS 1 will cover a huge swath of the planet to serve ships, submarines, aircraft, land vehicles and terminals in the hands of troops. "The ability for a warfighter to make a telephone call over a MUOS terminal and send data at 10 times more capacity than they can now will be a significant improvement," said Navy Capt. Paul Ghyzel, MUOS program manager. 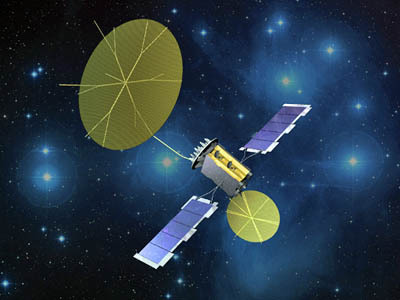 Four primary satellites and one orbiting spare will comprise the MUOS system as it is fielded over the next few years to augment and then replace the Navy's aging Ultra High Frequency spacecraft constellation. MUOS utilizes commercial 3G cellular telephone and satellite technology to provide UHF communications through "rugged smartphones" in the hands of troops, unlike the bulky gear needed to talk with the older generation of satellites. "With MUOS they'll be able to move around the battlespace," said Navy Cmdr. Jeff King, a MUOS systems engineer. "They'll be able to communicate to users on the other side of a mountain or the other side of the world."